I am so thankful that our plans changed and we were able to extend our stay in Indianapolis! 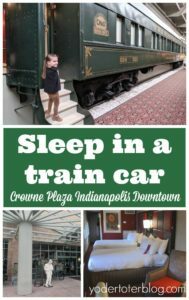 I had been eyeing the Crowne Plaza Indianapolis Downtown for some time knowing that they had train car hotel rooms. Staying in a unique accommodation creates a memorable experience for young and old and this was definitely one we won’t soon forget! The Crowne Plaza Indianapolis Downtown is housed in historic Union Station. The station was the first Union Station to be constructed in the US in 1888. Presidents Theodore Roosevelt, Woodrow Wilson, FDR, Harry Truman, and Dwight Eisenhower were just a few of the VIPs that walked through Union Station. Now, the station has been fully converted to a hotel and event space. You can learn more about the history HERE. As I mentioned above, we chose a train car room with 2 double beds. The hotel also offers rooms with one king. 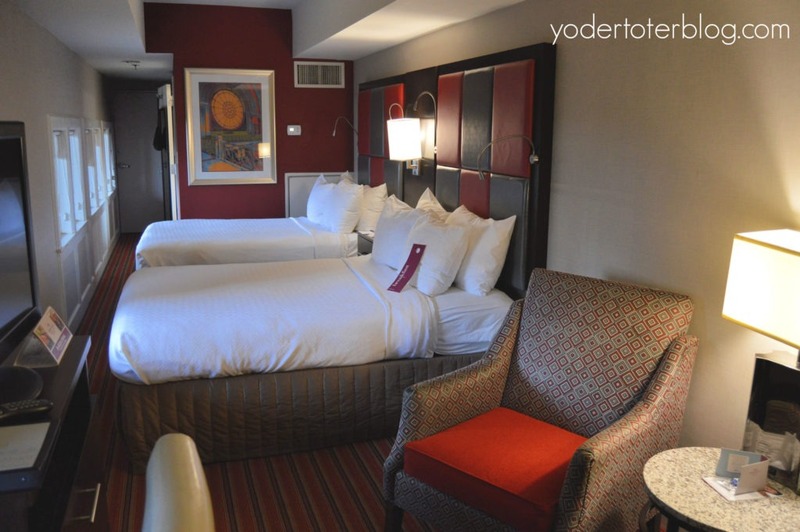 The rooms are definitely smaller than a typical hotel room, measuring at just under 300 square feet. There were five of us, but thankfully Cecilia was small enough to sleep on the two chairs pushed together! If you’re traveling party has five and there are older children, you may want to get two train cars. 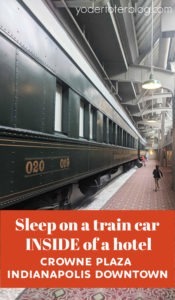 The hotel also offers regular hotel rooms, so if someone in your party requires a handicap-accessible environment, the train car would not be the way to go! 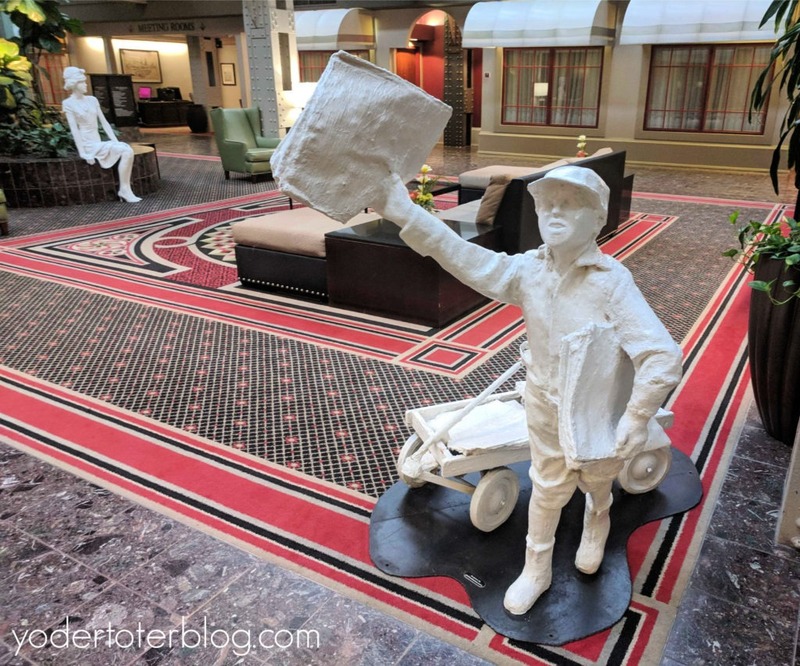 Throughout the hotel are numerous white statues! I thought these added to the historic ambiance of the hotel, but my Instagram followers overwhelmingly agreed that they were a little creepy! The kids liked finding all of the different ones! If we had stayed for more than one night, I think I would have created a Scavenger Hunt of Statues to keep them busy! 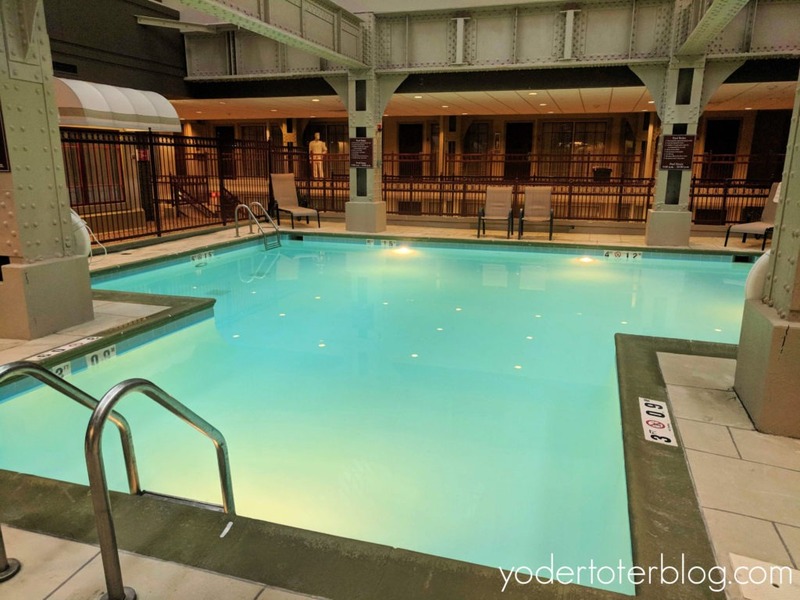 The hotel offers a indoor pool and on-site restaurant. The pool is a great size! We dined for breakfast at the Crowne Plaza’s restaurant, 123 West. I was happy with the serving sizes and prices. Kids meals are only $6 but do not include a beverage. I’m glad we chose a train car room at this historic Indianapolis hotel! It was a different travel experience that we will talk about for a long time! Looking for something to do in Indy with kids? Check out the Children’s Museum.